It is very important that the air you breathe inside your house be clean and fresh to stay healthy and free from any respiration related issues. It is important that the air ducts in your house are clean to improve air quality, energy efficiency and to prolong the life of your HVAC system. People suffering from allergies and respiratory issues is steadily rising, it is affecting the lifestyle of more and more people every day. Thus, it is imperative to keep your ventilating system and air ducts clean. 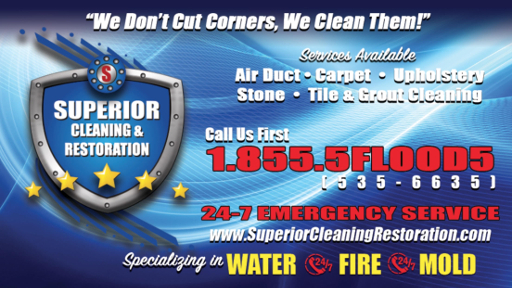 Superior Cleaning and Restoration Inc. guarantee the people of Oceanside clean air inside their house. We remove and sanitize every vent corner, agitate all ducts with Roto-brush cleaning units and then further vacuuming the complete system with a Truck-mounted duct cleaning system. Mold, mildew, dust mites and other bacteria are harmful particles that spread allergies. The dark and damp conditions inside the air conditioning ducts aid their growth. Since the ducts are responsible for heating and cooling, it adds to the risk of the allergies prevailing in the house at an even higher rate. Dirty filters and poor ventilation blocks fresh air from outside reaching indoors resulting in further contamination of the indoor air. Air duct and vent cleaning are important if you do not want your house to be at risk for asthma, allergies and other respiration related problems. Cleans vents play an important role in the prevention of such issues from your house. A clean HVAC system removes the risk of allergies from pollen, dust and mold. Clean air ducts and vents also increases the life span of your HVAC system. You will see and feel the difference after your air duct is clean. It is recommended that you get your HVAC system cleaned annually. Fresh air in the house is vital for you and your family and we make sure you get it.